They better make a toy line!!! Pretty impressive. I don't' like the voice they chose for Saint Walker though. It just doesn't sound like him to me. I believe that was Phil Morris, and I actually liked him doing the voice for SW, while I didn't expect him to be voicing Saint Walker, I did find he did a good job for what we were shown in the small clip. I am more concerned with Tom Kenny (who is awesome) doing Hawkman's voice, (if that guy that was chained up was actually Hawkman.) IMO Tom kenny doesn't really seam like a great choice to voice Hawkman. But again we only saw a few minutes and we aren't sure if that even was Hawkman, so I'll have to actually wait and see/hear before I completely say meh or yeh! I find this strange that the humanoid figures seem to be small while Zilius Zox is big. I like my figure and yes this is a prototype (one of many that I have). If Mattel doesn't want to release them that is fine, at least I have one of the better figures (not)released. I just love the fact, that there is more to this show than just Green Lanterns. as much as retailers were burned with the GL movie toy line, the problem was, in the end, there really werent any bad guys. You had 16 different green lanterns and that was it. No villians, no sidekicks, no guest appearances. 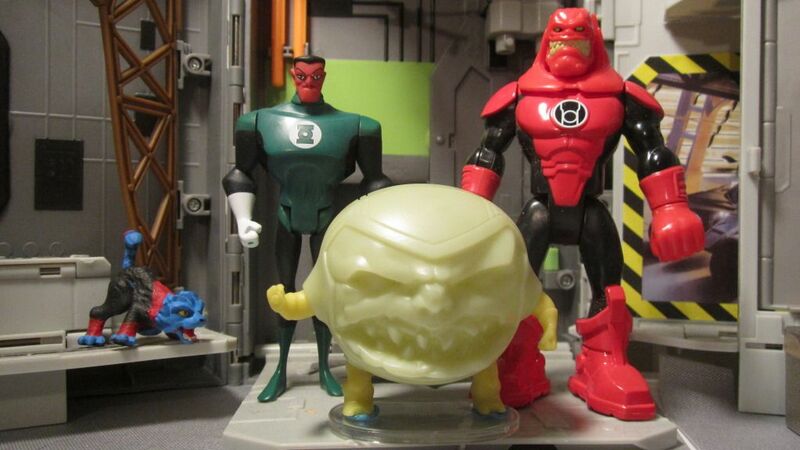 In GL-TAS, you have blue lantern, villians, red lantern sidekicks. blue lanterns. this week had a hint of maybe some yellow lanterns in the future. I did the photo to show what the test shot/prototype figure would fit in with the JLU & Heroes World line. I seriously doubt that was Hawkman. Even though all Thanagarians start to look the same, after a while. Someone mentioned that Mattel's keeping the Movie's 3.75 scale for the animated line. Not thrilled about that. If they do the figure in that size I will not be collection the whole series like I did with JLU and Young Justice. I want them to fit in with the JLu lineup. Since they are releasing a YJ scale Hal Jordon there is not reason to do it in there size. I hope it isn't Hawkman, but alot of people are thinking it is over at Toonzone, (actually maybe not "alot" possibly just a few ) I myself don't think it is, but either way I want GLTAS figures! andCJF28 I completely agree, sure we collectors could have all 15-16 GL's fight a Green Sinestro, but kids don't exactly know who Sinestro is, lol. So yeah Mattel screwed up on the toyline, but ultimately I blame the movie for not having villains that Hal can physically go toe to toe with... or atleast hit in the face, (In my eyes Hector Hammond was not enough, and Paralax was too big a villain to be defeated so easily,) the movie was just too big for its britches. of the DCAU, we'll see...But please let's get some decent sized figures!!! If it's supposed to be, they did a terrible job keeping it consistent, because the cartoon doesn't have those hideously overdone costumes. I took it like the original FOX Batman the Animated Series was a tie-in to first two films with similar versions of Gotham City being very dark and Gothic as well as a similar Batmobile. Yet keeping the Batman suit very comic book style in nature or more of a hybrid of the comic and the movies at the time. At this point the comics didn't include the black suit yet. At least that's how Wizard/ Comic Scenes and CSN explained it back in the day. Here is a serious question. As I understand it a cartoon without a toyline is doomed. I can think of a number of cartoons that died after their toyline bombed. I am also thinking about Static which made it for 4 seasons and the Legion which made it only two. If this is true, isn't GL doomed at this moment unless they try a toyline in the not too distant future? For me I will only buy a toy line which fits either JLU or the Hasbro DCAU. If the line is in some other scale, I will only buy the figures which fit in the afore mentioned lines. I agree with Mrinvincible, I the figure are any any other style I will pass them up. I am tired of toy companies who kept putting out different lines just make the collectors buy a whole new lineup.